UNIVERSAL WELD-ON INSTALLATION, skill or exhaust fitter required. COLLATE LENGTH & DIAMETER OVER STOCK DIMENSIONS. Pipe features both performance- & sound-adjustment. Success of these high-flow exhausts is attributable to a state-of-the-art technology. 3 adjusting rotary discs & Triple Perf-Tube-Design chamber provide you with countless sound- & performance levels, allowing you to alter them easily & steadily. Owing to its standalone adjusting rotary discs you can max out output & customize exhaust sound from silent humming to roaring cannon. Amazing sound coupled with aggressive HP boost. Pipe adds 7% extra horsepower on bone stock quads. One of the most effective modifications enthusiasts make to their ATV is the exhaust. It's one of those instant gratification things; mash the throttle & hear exhaust come to life. It's proven, dumping a factory exhaust & installing performance pipe, increases horsepower. Are you after better power delivery & impressive exhaust note? 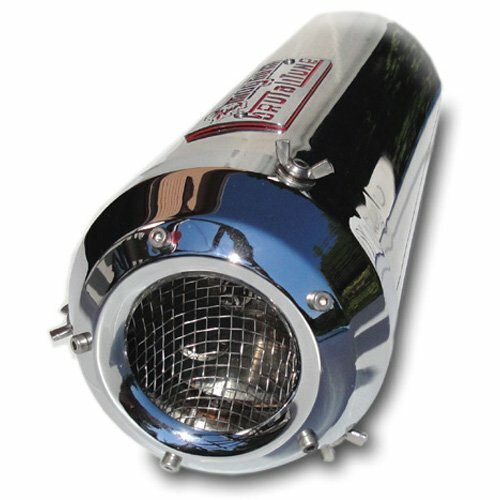 Throw away stock exhaust & exploit your quad's hidden swelling energy with MAGNUM tunable exhaust. Special interwoven acoustical fill that surrounds perforated tubes, provides sufficient restriction against exhaust gas & guarantees ultimate output. Packing is made of quality materials & absorbs metallic noise produced by pistons & rings. Hand-polished SS body gives you the look & feel of having power. Backed by 5-YEAR WARRANTY. Muffler is not Bolt-on to your quad. Although it installs weld-on that might frighten off do-it-yourselfers, cone inlet makes setup easy: can be conducted in an hour by exhaust fitter. Exhaust note is louder than stock. ooo Not street legal is some states. ooo On emission controlled ATV's CEL is triggered. ooo To remedy CEL, Magnum O2 Sensor Sim. is a must. ooo 17.75 inch exhaust recommended up to 300cc. ooo 19.75 inch Long recommended to 300cc up to 800cc. ooo 21.75 inch Long recommended over 800cc. If you have any questions about this product by Magnum Tuning, contact us by completing and submitting the form below. If you are looking for a specif part number, please include it with your message.